Date & Place of Birth: July 1st, 1950. AlKadhumiya - Baghdad, Iraq. Occupation: Dean / Professor in Architecture. Work Place: Al-Nahrain University / College of Engineering. Head OF Architectural Dept. (2005-2007), (2009- 2011). (2003 - Present) Professor in Architecture, Al-Nahrain University, Baghdad, Iraq. Designing and supervising many architectural projects in Iraq, UAE, Algeria, Oman and Kuwait. As well as many other projects. As well as many Touristic and Residential projects. 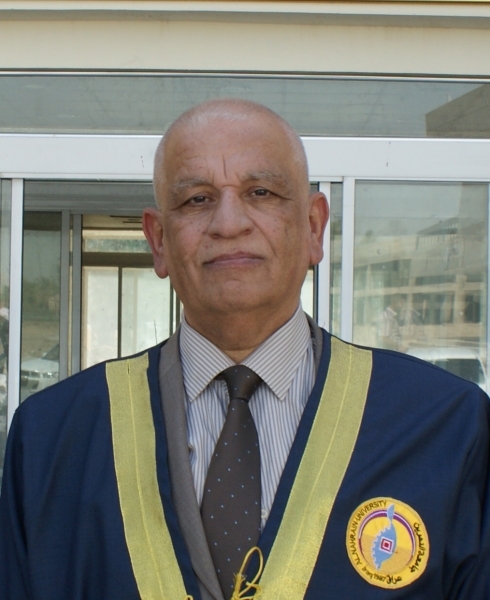 Scientific Promotion Committee member / College of Engineering (2003-2005) and (2011 – to date). Members of many Architectural Research Groups. Member of many judging committees for international, national and local architectural competitions. International Conference of Gul-Baba, an Islamic Center in Budapest, Hungary,held by BME, (1987). National Meeting for Clay Buildings of Saharan Architecture - Bechar, Algeria, (1992). International Meeting for Water and Architecture in the Desert - Adrar, Algeria, (1996). International Meeting for Mizab Architecture - Ghardaia, Algeria, (1997). National Meeting, Grand Cities - Oran, Algeria, (1997). International Seminar of The Space Saharan and Development - Biskra, (Nov. 2000). International Seminar of The Enseignement et Pratique de l' Architecture, Quelles Perspectives - Alger, (April 2001). National Seminar of The New Algerian Cities - Constantine, (May 2001). National Seminar of Space and People - Oran,(2002). National Seminar of Urban Planning Institute - University of Baghdad, (August 2005). "The Baghdad Oriental House", Ath-thakafa Al Jadida, No. 179, London, 1986. "The Rebuilding in Iraq", Ath-thakafa Al Jadida, No. 201, London, 1988. "The Baghdad Circular City of Al-Mansour", Ath-thakafa Al Jadida No. 218, London 1990. "Aspects in Iraqi Architecture", Ath-thakafa Al Jadida, No. 264, London, 1995. "Education and High Education in Islamic World", Ashtar No. 15, Australia, 1995. "Architectural Elements", Ashtar No 20, Australia, 1996. "Architecture, Tradition and Modernity", Ath-thakafa Al Jadida, No. 277, London, 1997. "Hassan Fathy, The Pioneer of Popular Architecture", Ath-thakafa Al Jadida, No. 280, London, 1998. "Post-Modern Architecture", Ath-thakafa Al Jadida, No. 283, London, 1998. "Architecture Crossing the History", Ashtar No. 25, Australia, 1999. "Vocabularies of Oriental House", Ath-thakafa Al Jadida, No. 292, London, 2000. "Villes et mémoire – Introduction á l architecture des villes Islamiques", Habitat, Tradition et Modernite (HTM) No. 02, Algeria 1994 (In French). "Une maison de terre en Hongrie" (HTM) No. 02, Algeria 1994. "La Problématique de l Eau dans la question de l Aménagement et du Dévelopment des Espaces Sahariens", Centre de Recherche en Anthropologic Sociale et Culturelle, Algeria, Des. 1996 (In French). "Contemporary Architecture in Baghdad" – Its Roots and Transition translated to Arabic, Ath-thakafa Al Jadida, September to October, No. 290, London, 1999. "Experience Accumulated from the Urbanism and Architecture of Arab Cities", International Seminar of the Architecture and Algerian cities Face 21st Century, Briska, Nov. 1999. "Architecture and Urbanism in Hot Sectors", International Seminar of the Space Saharian and Development, Biskra, November 2000. "Theocratic Art and Architecture at Renaissance Period", Ath-thakafa Al Jadida, March – April No. 299, 2001. "Glances from the History of Education in Iraq", Tamouz, No. 17, Autumn 2001. "Urban Space in Saharan City", National Seminar of Space and People, Oran, April 2002. "Zaha Hadid and Decostructivity", Tamouz, No. 19, Winter 2002. "Sustainability and Traditional Urban Tissue", Engineering Journal, Apr 2013.